How might we make data more tangible, persistent and persuasive? How might we make data more tangible, persuasive, and persistent? "How might we make data more tangible, persuasive, and persistent?" This was the challenge I posed to myself during my internship at IDEO Chicago. My answer is an artistic exploration made tangible through different design disciplines: data design, industrial design, and electrical engineering. The data for this exploration is the energy usage of the Chicago studio during 2015. An algorithm created with Grasshopper, a visual programming language, turned unfiltered data into a three-dimensional object that I CNC-ed from walnut. While the digital object created through the algorithm is completely scalable, adaptable, and unique, the physical object synthesizes the ephemeral phenomenon of energy into one concise and compelling sculptural form. Translating energy data into a tangible and visual interface. RaspberryPi together with capacititve touch components were used to create the visual interface. Visual programming with Grasshopper was used to create the wooden surface. Python coding was used wiht the RaspberryPi. A lot of hours were spent in the workshop for prototyping and building of the panel. Industrial Design was implemented during the creation process but also during the ideaiton phase. The studios energy data milled out of walnut wood. Detail photos from the assembled panel. The project was published on IDEO Labs, you find it here. With no background in any programming language or coding I used tools which I know from my Industrial Design background. To create the translation between data and 3-D I used Grasshopper. It is a plugin for the 3-D modelling software Rhinoceros and it is a visual programming language. The code in Grasshopper allowed me to pull in the data from a Excel spreadsheet and convert it into 3-D shape; then it was ready to work within Rhinoceros. Because Grasshopper is a plugin for Rhinoceros, you can see what you’re doing as you go. The Grasshopper is available with some example files on Github. Wanna recreate the project? Feel free to download the code here. A detailed picture of the Grasshopper code. The Grasshopper code which translates energy data into 3D objects. With the code all set, the next step was to create a prototype of my installation and the touchable surface. Quick 3-D prints of the data which was created in Rhinoceros, were used to make a low-fidelity video prototype.It displays how the installation would look and work. The idea was to let the user feel the changing data via a touchable surface, and give him/her a visual representation of the data on the screen. The touchable interface is the main part of the installation. Therefore it was the first part to focus on and it was crucial to get it right. 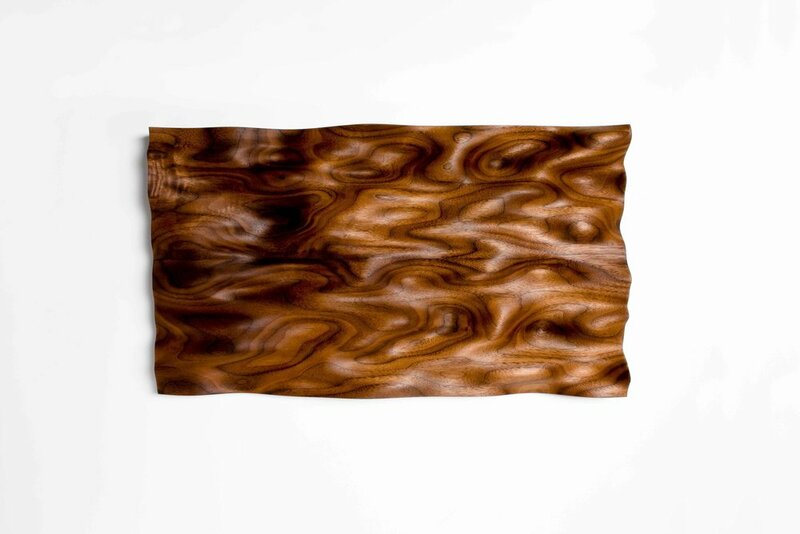 A long piece of walnut was used and cut to the needed length, then the resulting pieces were glued together. 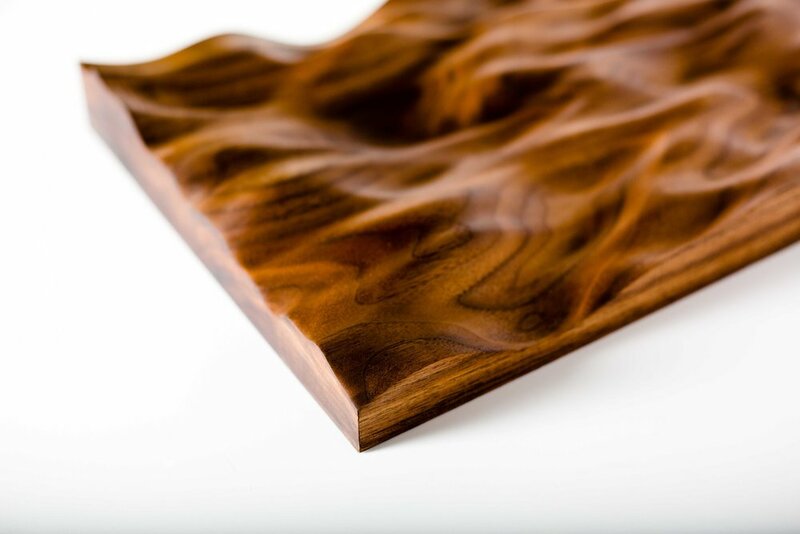 The undulating surface was created with a CNC table mill, which took roughly 10 hours for roughing and finishing pass together. The process was loud and dusty, but worth it. To get the perfect finish, it needed to be sanded— a lot. The last step was to stain it with Danish oil to protect the surface and bring out the wood grain. Test 3D prints and mill pieces. Wood after the roughing mill pass. The wooden panel after milling, sanding and oiling. To create the visual feedback, a Raspberry Pi was used, a capacitive touch board (MPR121), a 7” HDMI screen, wires, and some copper rivets. To display the data on the screen, a free download able piece of code found on the internet called PiPresents was used. For input, capacitive touch buttons were used, which were linked to specific images that display the data. Different Stages of the visual interface process. Soldering and coding for 2 weeks straight. Cable mess - Scotch tape always helps. This step was one of the harder parts. All the different pieces were brought together and to create the framed panel. A cheap frame from an art supply store was bought and used. An acrylic back panel, first laser-etched, then spray painted black to turn the etching black, then peeled of the protective foil and sanded it to make it matte. 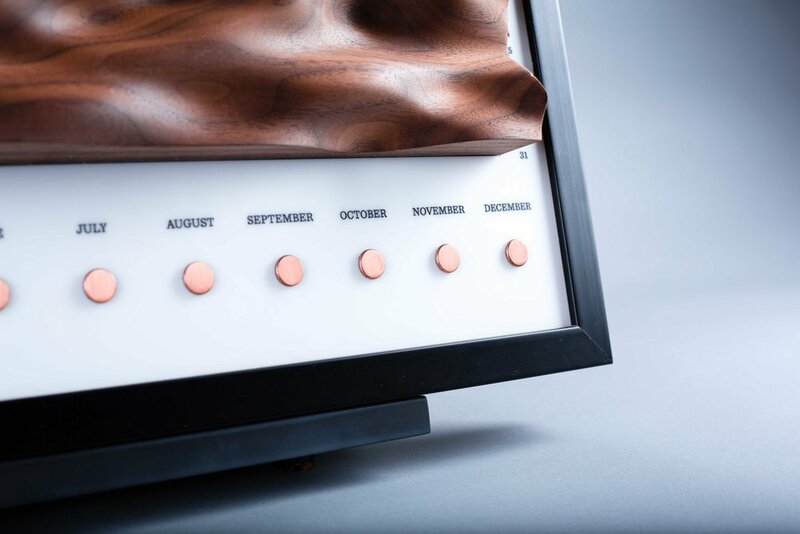 Next, the wooden panel was attached, then the screen, and it was connected with the 12 capacitive touch buttons, one for each month, arranged along the long axis of the wooden surface. 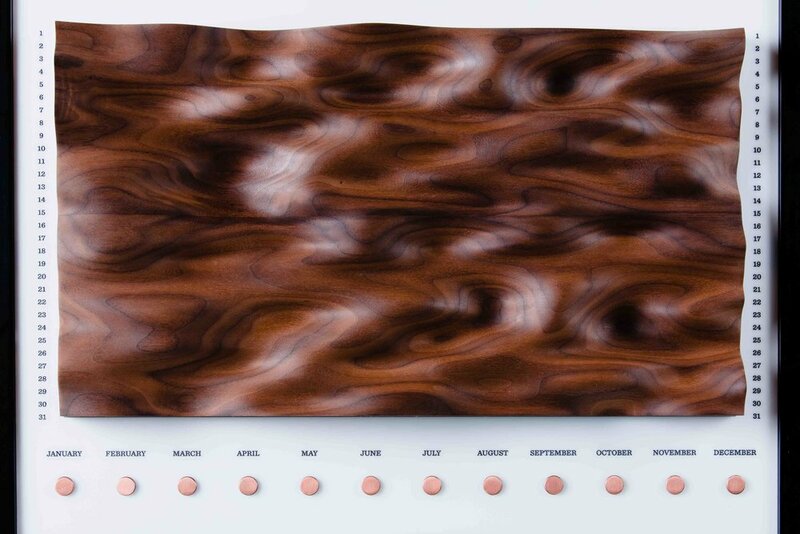 Once everything was in place, users could feel the wood to get a sense of our changing energy usage, then touch the buttons to see a drilled down explanation of the data by month. About a month and a half after I first came up with the idea, it was finally ready to present to the studio. Presented on the wall pof fame at IDEO Chicago. Short snippets from the final modelmaking phase. A big thank you to the whole studio, I want to point out Chris Gold for helping me during the milling process, Rob Rehrig for giving me a Raspberry Pi 101, and Sophie Feng for taking awesome final pictures and video. A special thank you to the Industrial Design Team, Carlos Arturo Torres, Dogan Sekercioglu and Florian Gerlach. Want to recreate the project? Check out the code on Github.